Someone thought this was a fun idea. It’s time for the Faith & Freedom Coalition’s “Road to Majority” conference in Washington, D.C., and all the big conservatives, including presidential aspirants, are in the city intermingling with thousands of grassroots activists. One of the features in a particular bathroom at the event is an Obama urinal cake. Yes, you heard right. 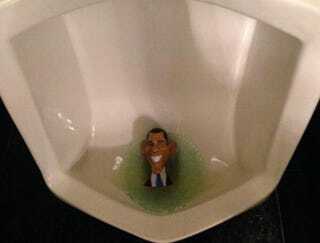 An Obama urinal cake. Huffington Post’s associate politics editor, Igor Bobic, tweeted out the image, which quickly caught media attention and spread like wildfire.